Our Kids Meeting the World – Making sense of an interconnected world. Together. 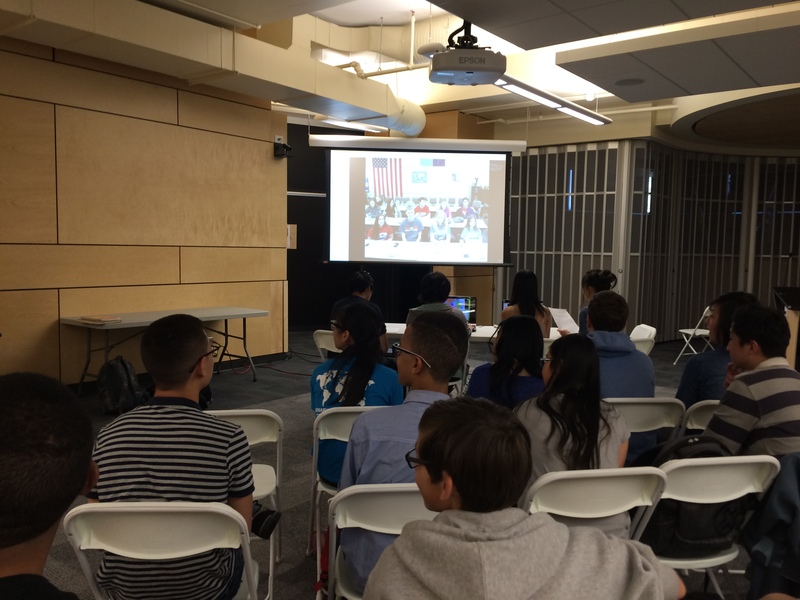 Burnaby students’ May 14th virtual conversation with American high school students from Passaic Valley High School in New Jersey reflects our seriously friendly ties, showing a mutual curiosity and desire for understanding. Maybe we have made a big deal about repelling the United States from a successful invasion of Canada in the War of 1812, but over the course of Canada’s nationhood, we have clearly moved beyond this defining historical incident. About 300,000 people cross between the countries every day. And in the areas of trade, defense, environment and energy, Canada is integrally connected to the United States – working within the same international or bilateral committees, or jointly researching new technologies. During their videoconferenced session, Burnaby students first presented an overview of both Burnaby and Canadian current issues, leaving the rest of the time open for questions. American students were very much interested in the organization of Burnaby schools. One student was excited to share that she would be travelling to Vancouver for the next school year of 2015-16, in order to attend Emily Carr University of Art and Design. She was most interested in the difference in prices between the US and British Columbia. Students had many political questions. What were students’ thoughts about the issue of gun control? Who would be the next president of the United States? Who was responsible for cost overruns at the 2010 Olympics? All in all, the interactive session highlighted not the differences, but the similarities between the New Jersey and Burnaby groups. Everyone was curious about each other’s preferences and habits. Everyone had compassion for those caught in war-torn regions. And no one let the War of 1812 get in the way of the youth of two neighbouring countries, currently with the longest undefended border in the world, getting to know each other. Previous Post Peers. Globally Aware. Next Post The Fun of MUN. And much much more.